Twelve Dancing Princesses, retold and illustrated by Brigette Barrager. Another fairy tale book to share with you today! This one is Twelve Dancing Princesses, illustrated by Brigette Barrager. Barrager, you may recall, is the illustrator of Amy Krouse Rosenthal's darling Uni the Unicorn. This is a simplified version of the original fairy tale. I happen to like the darker undertones of the original Brothers Grimm story: the defiant princesses, the brutal deaths of the men who fail to solve the mystery, the fact the victor chooses the eldest princess to wed because she's closest to his own age. This version might be more suitable to the youngest set, however. The text is as simple and playful as Barrager's adorable princesses. In this version, the hero is the palace shoemaker. His favorite princess is Poppy (we don't know her age compared to the others'), because she was nice to him. The princesses are under a spell at night, and have no idea what they do when they're asleep. No one dies. There's a happy ending. Simple and sweet, just right for the preschool set. You can read Brigette Barrager's own blog post about the book here. Wouldn't this be a sweet gift for a little beginning dancer? To complement the book, Barrager and Chronicle also put together a "Stage & Play: Princesses" set, "Princess ABC Flash Cards," and a "Princess Matching Game." I'll leave you with a glimpse at my own dancing "princesses." Last week was Observation Week, which meant family got to sit in on dance classes. 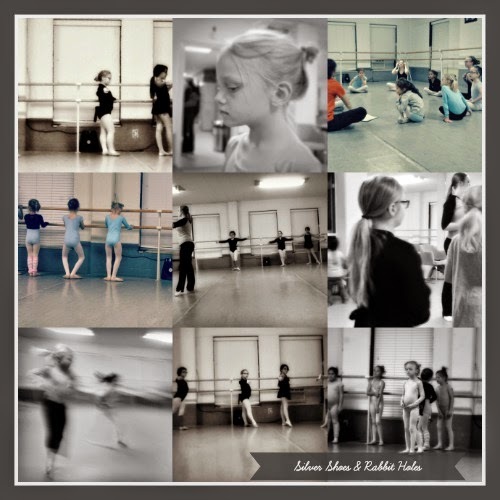 We got to observe Little Sis's ballet class a second time, because she had a substitute last week. Big Sis is very grumpy about going to dance tonight. Today, the temperature is supposed to hit 75 degrees! In January! (NOT RIGHT.) It's supposed to be colder tomorrow, with a chance of snow Saturday. (Really. This is Kansas.) She is less than thrilled that on the last unseasonably warm and sunny day, she will be stuck indoors. I do feel badly for her. I think she's solar-powered. The book is absolutely beautiful, and your princesses too! I remember Observation Week from my own dancing days. It was so exciting. Ah, how I miss ballet sometimes!.. I had to beg the oldest to let me watch her three classes! I reminded her that I could watch on the monitor from the parents' waiting room anyway, so why not let me just sit in the studio? She finally relented. ;) She says she doesn't mind the stage, because the lights make it hard to see faces. She didn't want me to make her nervous. She got over it.